Tesla will add at least 500 more workers by year's end in California, where it assembles the Model S.
LOS ANGELES (Bloomberg) -- As quietly as one of its electric cars, Tesla Motors Inc. has become the biggest auto-industry employer in California. Tesla now employs more than 6,000 people in the state, the automaker said, offering the first public snapshot of its workforce this year. That moves the fast-growing company well ahead of Toyota Motor Corp., the world’s biggest automaker, which has 5,300 direct employees in California -- a count set to fall after the company said it will move a majority of those jobs to Texas by 2017. Tesla will add at least 500 more workers by year’s end in California, said Simon Sproule, a spokesman. Led by billionaire CEO Elon Musk, Tesla is the rare company doubling down on making products in California, which has relatively high labor and energy costs and stiff environmental guidelines for laying down new plants. Texas and other states, meanwhile, are luring manufacturers with vows of lower taxes and less red tape. Tesla is already a bigger local employer than many high-growth California-based technology companies. At the end of 2013, according to an annual filing, Tesla had 5,800 employees worldwide -- with about 90 percent of those in California, Sproule said. Twitter Inc., according to recent filings, has 3,000 employees worldwide and Facebook Inc. has about 7,000. The state’s biggest employers are government entities, including some University of California branches that employ tens of thousands of people each, while Nestle USA Inc. is among the top private job providers with 20,000 in-state workers, according to Career One Stop, sponsored by the U.S. Labor Department. Tesla’s sprawling factory in Fremont, near San Francisco Bay, has witnessed the booms and busts of California carmaking. Built by General Motors in 1962, the 5.5 million-square-foot plant once sent out hundreds of thousands of gasoline-burning Oldsmobiles, Buicks, Pontiacs and Chevrolets each year. GM closed the site in 1982 and reopened it two years later in a joint venture with Toyota. Shortly after GM’s 2009 U.S.- backed bankruptcy shut the plant again, Tesla snapped it up for a modest $42 million and retooled it to churn out electric cars. Its gray-blue walls repainted white, the plant is now the center of Tesla’s aspirations to become a new automotive power. Musk has said his company plans to build a half-million electric cars a year by late this decade. That would require Tesla to carry out its plan to build a $5 billion battery “gigafactory” that it has said could employ 6,500 workers. The battery plant would cut the cost of Tesla’s lithium ion cells by at least 30 percent, the company says, allowing the Fremont factory to make a sedan that costs far less than the current Model S, which starts at $72,000. Making goods in California isn’t cheap or easy, said DiCaro of the manufacturers association. He cited industrial power rates that are 55 percent higher than the U.S. average and workers-compensation premiums that are among the nation’s highest. Getting clearance to expand or open factories can take too much time and money for many companies, DiCaro said. California has focused more on wooing high-tech, defense and aerospace companies rather than old-style manufacturers, said Maryann Keller, an auto-industry consultant who has served as a director at Dollar Thrifty Automotive Group Inc. and Lithia Motors Inc. Musk, with a product that is part heavy equipment and part high-tech, has a foot in each camp. “These days California has its centers of excellence that have nothing to do with the automotive industry,” Keller said. Musk has cited lengthy approval processes as the main reason Tesla is considering other states for its gigafactory. He has said more recently that California is also a candidate. Gavin Newsom, California’s lieutenant governor, said Tesla’s success is consistent with the state’s values and brand. “For Tesla, it makes perfect sense to invest in this state and for this state to invest in their success,” he said, adding that the state is evaluating rules that may inhibit manufacturing. Late last year, Governor Jerry Brown announced new tax credits the state can use to persuade companies to add or keep jobs, as well as tax breaks on the purchase of new equipment. Tesla, the only publicly listed company making cars in the Golden State, also is planning to hire workers for a former Chrysler parts-distribution site it’s retooling in Lathrop, an hour east of Fremont, Sproule said. He declined to elaborate on what work Tesla will do there. Tesla, with headquarters in Palo Alto, also has a design studio in suburban Los Angeles. Since early 2013, Tesla has added more than 3,000 direct employees to boost Model S production and prepare to make Model X electric sport-utility vehicles, said Diarmuid O’Connell, Tesla’s vice president for business development. While California is a center for auto design, financing and marketing, its time as a carmaking hub appeared to end in 2009, when Toyota shut New United Motor Manufacturing Inc., the Fremont factory it shared with GM for 25 years. After GM opened the factory in the early 1960s, it was one of six California auto-assembly plants operated by GM, Ford Motor Co. and Chrysler. Together, the automakers employed 42,500 California workers at the peak in 1973, according to the Bureau of Labor Statistics. When Tesla bought the idled NUMMI plant in 2010, Keller and other analysts were skeptical that the startup could ever use a facility with a 500,000-vehicle-a-year capacity. 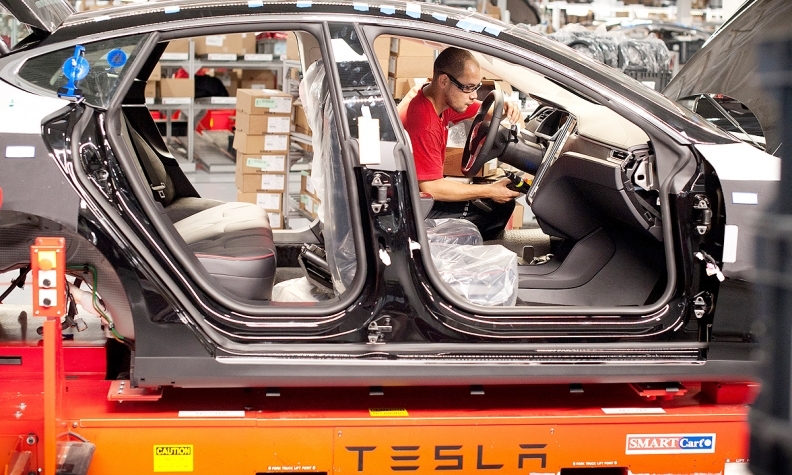 When Tesla started production there in 2012, it said it was using about one-fifth of the site. Now it says it’s using 40 percent to make electric motors and battery packs as well as cars. Toyota, which set up U.S. operations in Los Angeles in 1957, said April 28 it will shift most of the sales, marketing and finance jobs from Torrance, Calif., to a new North American headquarters in Plano, Texas, leaving about 2,300 jobs in California. Toyota has said its main goal is to boost efficiency by combining sales, engineering and corporate units. Honda Motor Co., which also has sales, marketing and financing operations in Torrance, said it has about 2,500 direct employees in California. Hyundai Motor Co. and affiliated operations have 1,802 California employees, said Lori Scholz, a company spokeswoman. Kia Motors Corp., Mazda Motor Corp. and Mitsubishi Motors Corp. also have U.S. sales units headquartered in California.